Free VKontakte Followers & Joins Exchange! VK (Originally VKontakte) is the second largest social network service in Europe after Facebook. It is available in several languages, but particularly popular among Russian-speaking users around the world, especially in Russia, Ukraine, Uzbekistan, Azerbaijan, Kazakhstan, Moldova, Belarus and Israel. Like other social networks, VK allows users to message contacts publicly or privately, create groups, public pages and events, share and tag images, audio and video and play browser-based games. VKontakte is pretty similar to Facebook in its functionality and nature of usage. Individuals share photos, video, audio and text with their friend. The platform offers few additional features to its audience such as custom audio playlists creation; ability to share videos of unlimited length (such as conference records, webinars, tutorials, etc.) and super detailed inner search capabilities. VKontakte has 3 official languages – English, Russian, and Ukrainian, but there are other unofficial translations done by the users (including German, Spanish, Italian, Hebrew, Arabic etc.). Many local businesses in CEE discovered the power of VKontakte and most of them create virtual presence in the network to increase their brand exposure. Companies generate dedicated pages and invest in creating communities of fans around them so they could keep continued contact with their audience. Also, due to the targeted nature of VKontakte advertisement systems, it is easy for businesses to publish Ads to targeted audience based on parameters like: geography, demographic, hobbies, interests, education, birth dates, travel, gadgets used, etc. It allows businesses from all sizes to invest in paid campaigns. To sum up, if you are planning to expand your business and wish to engage new audience you are in the right place. The biggest Russian social network Vkontakte has became the most visited website in Russia with 23 million visitors daily. Vkontakte continues to change and introduce new rules and features. Despite visual similarity to Facebook, running campaigns on Vkontakte requires more patience and a different approach. If you want to create a buzz around your brand and listen to what others have to say it is definitely worth trying Vkontakte. Vkontakte has introduced a new type of advertising: video banners. This exciting innovation means that each time a user clicks on a small textual and visual advert a full screen video appears. These adverts are made to encourage sharing of content between the network users. People can "Like" adverts, add to "Favourites" and see other people who are fond of the same videos. Another significant change is the possibility to create public pages! Vkontakte allows the changing of groups into public pages. This makes it easier for organizations and businesses which previously were only able to use groups to engage with their audience. It is free to create a public page and any member can do so easily. The only difference to Facebook is that you have to provide a phone number to get the page activated. As of today there are hundred public pages falling into the following categories: places, small business, companies, organizations, celebrities and goods. It is exciting to follow developments introduced by this network and learn about its members. Bearing in mind that Vkontakte provides many opportunities for understanding how the product or brand is being perceived in various regions of Russia, not simply exclusive to major cities. Hopefully, new changes will make Vkontakte a more pleasant place to be allowing their members to enjoy communication with each other. Despite all the criticism, Vkontakte will remain the most popular social network among Russian speakers, due to its main feature: free access to the massive library of video and music files. 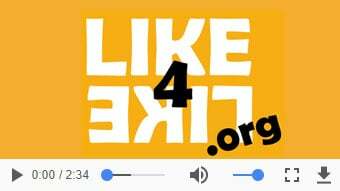 As you can see Like4Like.org is the best way for your website promotion. Our site has no boundaries and will enhance your brand recognition equally well in all parts of the world.